I've come to face the music. With two kids under the age of 3, a full time job, and plenty of other things that share the clock with my hunting passion, I simply don't have as much time to scout as I did as a single man. The reality of life is that some things, like family, do take precedent, so my time in the whitetail woods has to be both efficient and effective. Even though a four hour drive to Pennsylvania's Northern Tier for a scouting trip isn't in the cards every weekend, there are still ways I manage to do some homework in the evenings after the house quiets down. That homework, and the tools I use, are valuable components of my scouting efforts which allow me to maximize my time afield and make the best of that limited time I have to traverse the hills of the two highest hunter density states in the Union. The process I’m talking about is cyber scouting, and most are probably familiar with the term in this age of technology and the internet. For those needing an introduction, cyber scouting is simply using all the online tools at your disposal to narrow down high percentage areas within a larger piece of property. Google Earth is a good place to start. By eliminating the average ground, you can increase your scouting efficiency when you eventually get to put boots-on-the-ground. Even more, with practice and experience, you can leverage your cyber scouting efforts in such a manner to effectively select stand locations for those situations when you may have to go in "blind", i.e. hanging your stand and hunting on your very first trip into a parcel. Admittedly, I probably spend too much time sitting at my laptop perusing pieces of public ground daydreaming, or even looking at private parcels I may want to ask permission on. When I am scanning for properties, the fastest way to get a good idea of the way a piece of ground lays and its general terrain features is Google Earth (no big surprise there). Google Earth has a layering feature which highlights public parks, state forests and game lands. Although it’s a bit of a case of ‘hunter beware’, as the boundary lines are almost always wrong. Once you have yourself a piece of property that looks promising, you'll want to move around the property in Google Maps. This allows you to see the terrain changes and elevation differences of the piece. As a rule, if you’re hunting flat land with little elevation change, such as marsh country, you can utilize the simple aerial photo view and pin point subtle elevation changes by the variation of the vegetation. Trees in the middle of a marsh indicate high, dryer ground, and whitetails need an elevated piece of real estate to bed, so these are automatically places to mark on your scouting itinerary. Note that other vegetation variations is also important, since the majority of travel in marsh or swamp land will occur along the transition between dry ground and wetland which will be made evident by this change in flora. Bedding will often be present on the points of peninsulas of high ground extending out into the wetland. Depending on the type of vegetation (cattails are a prime example), and the quality of the aerial, you even may be able to identify deer trails moving between peninsula and island features within the marsh. You can plainly see deer trails through the swamp in this image. This is typical so long as you're hunting an area where Google displays this level of detail. Many whitetailers across the country find ourselves in mostly hill country settings and at a general loss for swamp or marsh land. In hill country terrain, elevation changes are a hunter’s blessing. If the quick view of the property, via the bird's eye view on Google Maps, shows me a ridgeline with several spurs, a saddle connecting two ridges, transition lines of new regrowth and old growth timber or other habitat diversity, (and there are benches along the side hill of the ridge to boot), the piece has my attention and I'm instantly digging deeper. At this point, I say goodbye to Google Earth for a moment and head over to a www.hillmap.com Hillmap will give you the ability pull the piece of property up on a dual screen view and access a US topo map and aerial imagery simultaneously. I use this site to look for vegetation changes and cover funnels that correlate with those aforementioned terrain features. If you aren’t sure how to read a topo map, there are plenty of videos online to walk you through the process, but in short, the closer the lines are, the steeper the grade. When you look at the topo map, you’ll see that hills will have lines spaced further apart indicating a flat(ter) ridgetop. Where the lines are close together is the steep side hill of the mountain. 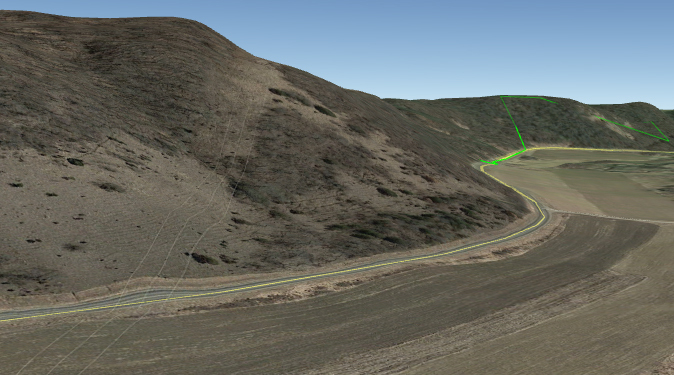 The transition line between the flat ridgetop and where the hillside breaks over is the military crest of the hill. This elevation will garner a majority of the deer movement because of the wind advantage this change in topography provides to traveling and bedded deer. Prevailing winds coming over the top of the ridge will bring scent from above the deer while rising thermal drafts, traveling up the hillside as the sun warms the air, allow deer to scent check the terrain below. Bedding on the military crest of the hill also provides a sight advantage to bedded deer looking down hill as well. If I can locate a hillside with a vegetation transition (namely young regrowth above the military crest and mature timber below), this is a spot that I will mark for further investigation. Deer will be able to bed on the transition line of this vegetation change, with full visibility below, while staying within two short bounds of the security cover above. I can also expect this to be a perfect cruising altitude for rutting bucks in late October and early November. Points, spurs and even subtle benches along this transition line are also spots to mark and later ground truth immediately after season. These points and spurs will typically hold bedding areas because deer can move around the point as the wind shifts throughout the day, keeping the prevailing wind coming over their back side. Vegetation transition, relating evening food sources and a ridge spur working in concert with one another could be your next foolproof hunting spot. Once I have, through my initial cyber scouting efforts, eliminated around 75% of the parcel as ‘average’ ground which I do not plan to hunt or even scout, I will also utilize www.CalTopo.com and www.mappingsupport.com to make sure what I saw over on hillmap.com was accurate. When I go to CalTopo, it’s usually just to use their hybrid satellite topo overlay setting. CalTopo.com overlays topo lines with aerial view. This lays less detailed topo lines over the satellite imagery, similar to what’s available with a Garmin Basecamp program (but it’s free and doesn’t require you to download the imagery). I use Mappingsupport.com for a more detailed terrain map with shaded relief. You will find that you can see surprisingly subtle terrain and elevation changes with this feature; in some cases, things that aren’t significant enough to appear on a topo. MappingSupport.com can show you terrain details that a topo map can't. This terrain map feature has allowed me to discover subtle transition benches between that cruising elevation, mentioned earlier, and the top of a ridge. These minor features are often terrain funnels and travel corridors, and lead to majorly beneficial stand locations that produce for years. Topo lines are also available on MappingSupport. When looking at a piece of public land, I'm also making important considerations on access points and the ability to evade hunting pressure. It doesn't always take a large, remote property to do this; sometimes there are less remote spots that remain overlooked. Water barriers may make access difficult for the average hunter, or there may be a section of timber that looks like a more traditional type of hunting spot that draws people away from a honey hole near the parking lot. If the access is too generous and there are so many parking lots that nearly every portion of the piece is within a couple hundred yards of the closest parking area, it’s probably not the place for me. That being said, there is a public parcel I plan to hunt this year that’s only 120 acres in size. The piece is divided in thirds by two roads and a parking lot. Each piece is relatively small, but one section requires access through a wetland or a significantly longer walk around the water. Additionally, this section doesn’t draw much attention because it’s narrow, has scrubby brush and junk trees and borders some open agricultural ground which is private. A bedding area surrounded by swamp in an otherwise easily-accessed parcel. Across the street, however, is the quintessential piece of public ground with oaks and other hardwoods on a nice gradual side hill with a short walk and easy access from the parking lot. For several years, I have watched basically every hunter come and go from that piece of timber while wholly ignoring the other side of the property. After a bit of research using my free online tools, I located a slightly elevated piece of ground narrowing to a point that extends into the marsh and has several mature trees on it. Approximately 150 yards above this spot are the aforementioned ag fields that hold plentiful deer numbers every evening. Given the prevailing winds in this area, a northwest wind will allow for clean stand access to set up and cut off deer that exit the point of the high ground in the evening on their way to the ag fields. While I haven’t ground-truthed this spot, I will go into this location with a high level of confidence that I can perform a surgical drone strike my first time in because of mapping the property and understanding how deer will prefer to use these terrain features. The best cyber scouting efforts are those followed up on with ground-truthing. When you have the opportunity to test your theories and verify what the maps are telling you, you’ll be better prepared for strategic access and stand locations come fall. Keep in mind that those boots-on-the-ground scouting sessions are most beneficial immediately after season when sign is fresh and relevant to hunting season patterns, (that’s probably good fodder for another post). Going in blind certainly has a lower success ratio, but if you’re limited for time, utilizing your online resources before setting foot on a property can stack the deck in your favor. Likewise, a little computer work prior to a physical scouting session saves you countless wasted miles and boot wear; and that gets you through each parcel faster and more efficiently so you can move on to the next potential hot spot, mapping more stand locations to help you connect with Mr. Big next Fall. Reuben with Mr. Big from a season past.